Guitars and technology complement each other perfectly. Whether you’re thinking of what kind of gift to give a tech savvy loved one who also happens to play the guitar, or you’re looking for something for yourself, you can’t go wrong with this list of the best guitar gadgets right here. Tired of playing air guitar when your actual axe isn’t nearby? Me too. Fortunately, you no longer have to get weird stares from strangers on public transport, now that you have a SmartGuitar. You’ll still get stared at, but it will be stares of envy. This bad boy connects wirelessly to your iWhatever (iPhone, iPad, iMac) and allows you to play… well, anything. Since it’s a MIDI controller, you can play any instrument like a guitar – including guitar! It also has some handy teaching apps that show you how to play, as if you didn’t already know. Have you ever wished there were less things in the world? Me too. But sometimes you need to invent new things to have less things. This new thing combines a condenser microphone and an audio interface. Not only great if your home studio is the size of a cupboard, but very handy if you like to record material on the road or in the rehearsal room. It has two inputs and two outputs, and can connect via USB and lightning cable. Don’t you just hate it when there’s No Fuel Left For The Pilgrims? Ok, that’s a music reference from my home country, but you should check them out. With the FuelTank you don’t have to worry about running out of fuel for your pedalboard. Not is it virtually noise-free, but you can fit five different effects pedals into it. And because it’s made from Vibranium (not really, it’s just regular metal) it’ll never break. 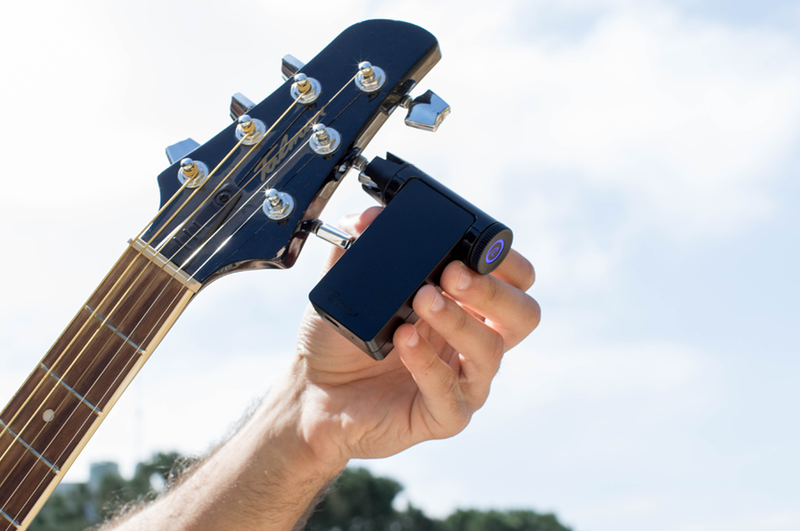 Another gadget for the iHeads, the iRig is perfect for acoustic players who need their sound amplified. The amplified sound is very natural, and has the same quality as a studio microphone. Technically, it’s super simple: you plug and play. Perhaps the best feature is that it allows you to jump around on stage without having to worry about it creating feedback if you come too close to a monitor. Here’s a nightmare scenario: you’re too old to have band posters on your wall, but not classy enough to have art on them. What do you put on your walls? Shelves? For what? Books are digital. Music is digital. Your plants are dead anyway. Boom. Enter the horizontal guitar wall hanger. Not only are your walls now decorated with your most prized possession – dinner guests will no longer doubt that they’re in the presence of a rock star. Roadie 2 is three times more accurate than your own ears. And if you, like my drummer, refuse to protect your ears during practice and performance, the Roadie 2 is three hundred times better than your own ears, you can tune or switch between different alternate tunings in just seconds. The best part is that it works perfectly even in noisy environments, and it is the best guitar tuner for intonation. Roadie 2 comes with 40 presets, and allows you to restring effortlessly. You also don’t need a phone to connect to – this one is standalone.